Yesterday, I reviewed the third Octomore release and gave a little background on the Octomore whiskies themselves. Today, let us take look at the fifth release, weighing in at 169ppm. If you're keeping track of the numbers, this release has the highest peated malted barley of all the Octomores so far. Also, even though there's a ".1" after the "5", I haven't seen any subreleases. Like the rest of the regular releases, this is a five-year-old whisky. It sells for $200 (wut?) and had a "limited" release of 18,000 of its monolithic bottles. Unlike the 3.1 end-of-bottle sampling from yesterday, this one came right from the top. Daniel generously waited to open his bottle of 5.1 for this Taste Off. He did make a very good point that because of the bottle's unique opaque glass, no one can tell what the heck the fill level is nor where drinky level is during its life after opening. The style is cool -- and I guess it's there to help soothe one's mind about the price tag -- but it's not as useful as plain old cheap glass. It's a whisky bottle, damn it! The color is the palest of the three. The oak notes are the mildest as well which makes me think there are more refill casks in this batch than in batch 3. The nose delivers a much sharper peat than the 3.1. One gets the smoke, the farmy veg, and fresh seaweed versions of peat notes. A clean beach whiff. Some fresh apricot and red hots candy. Very spirity. After some time opening up, the whisky releases a tiny bit of oak character in mild vanilla and caramel. The palate starts out hot and needs some air. It holds the farmy peat, but it's subtler than in the 3.1. There's a sugary sweetness, that I believe comes from the spirit rather than the oak. Lots of salty oceanic notes. But still, most of the peat notes remain mild. The finish gains a peppery spice. More the of the salt and ocean. A little vanilla and burnt wheat bread. The peat gets mossier. Where yesterday's 3.1 was loose and soft, likely from some oxidation, today's 5.1 is very tight, likely due to being from the start of the bottle. I've been finding this top-of-the-bottle tightness from all of the young high strength whiskies I've owned. I do think think the 3.1's larger oak presence also has a lot to do with its roundness, that's why I keep tying o-a-k in these paragraphs. 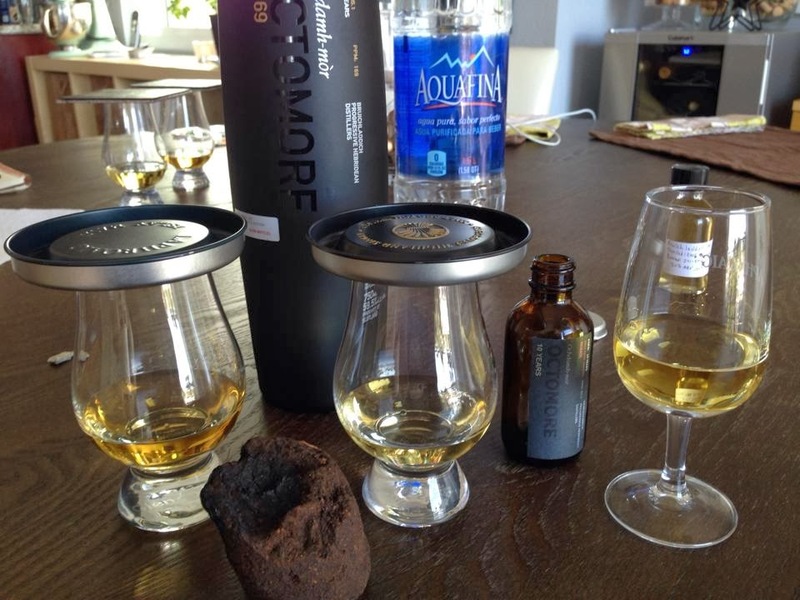 Still, the peat will not destroy your palate. As Jordan mentioned in yesterday's comment section, Bruichladdich's tall stills may be responsible for softening and developing the phenols -- and actually Ralfy has a similar thought in his review of this 5.1, which I just caught this morning..
Like Kilchoman's products, Octomore is a young whisky that tastes and noses very well. The financial quandary is this, you can buy 5-year-old Kilchoman single cask bottlings ($100, limited to 200-300 bottles each) twice over for the price of the regular 5-year-old Octomores ($200, limited to 18,000 bottltes each), and while a very small business runs Kilchoman, a large international corporation operates Bruichladdich. Not sure if that influences your choices, but I think about that sort of stuff all the time. Yes, your comments regarding Kilchoman/pricing/size-of-operation are also things that are always at the back of my mind. If you're asking me to buy very young whisky, it better A) taste really great, and B) not be ridiculously expensive. Definitely. The Octomores sit at the crossroads of the two current movements of the whisky industry: Younger whisky. More expensive whisky. Thus, what we have here is young expensive whisky. I'm not sure how long that sort of approach will succeed. And if you do the math, the retail value of a single run of Octomore is almost $4 million. That's not chump change, even if Bruichladdich only gets a fraction of it and you factor in production costs. Yeesh, true. One wonders how much more expensive this stunt was as opposed to regular peating. And they clearly filled a lot of barrels. What if it had gone poorly? Or perhaps some of it did and they're still recouping those losses. Then again, half of the Murray McDavids I've had seemed like McEwan experiments gone bad, but they were bottled anyway. And then there's the Black Art series which tastes and smells like a hot mess, but are still bottled and sold for $200-$300 a bottle. The most recent run of those would be almost $4 million as well. 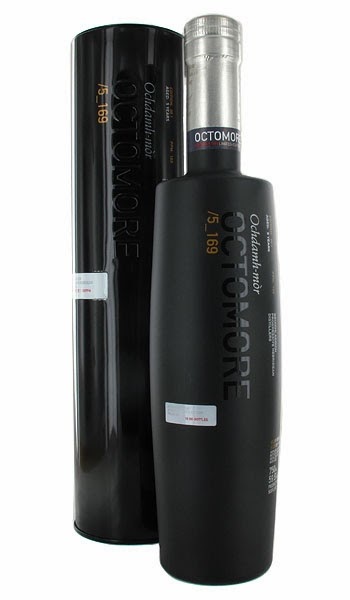 The more reviews of Octomore I read the more I feel like the adjectives 'interesting' and 'educational' apply. With the possible exception of the Comus release, none of them actually sound like something I would want to sit around drinking while I was trying to relax. They're example of what *can* be done, but I've yet to be convinced that they're something that *needs* be done. Certainly not something that I want to be spending that kind of money on. My stance that the Octomores seem like stunts still stands after this tasting. So I agree with you on that one. I think some of the results are pretty good, though I've just lowered the 3's rating down to 3.5 stars because it's certainly comparable to Kilchoman Machir Bay (which is $55-$60 around here). While the Octomores still have their fan base, my whisky buddy Daniel is amongst them, the bottles are not disappearing from the shelves as rapidly as most annual big event releases. In fact, the 10yo, which had a release 1/3 the size of the regular Octomores, is still available everywhere a full year after its release. On another hand (the third hand? ), had they priced the Octomores around the same price range as the original PCs and Kilchoman single casks, I'd be bitching a lot less about them and perhaps consider getting a bottle.